His House wants to thank EVERYONE again for the wonderful donations contributed to our Holiday Boutique and Giving Tree. All gifts go directly to families in need from our community. We focus on local homelessness, and sharing the blessings that you have given to us, to share with others. I wanted to share a very meaningful story from this season. 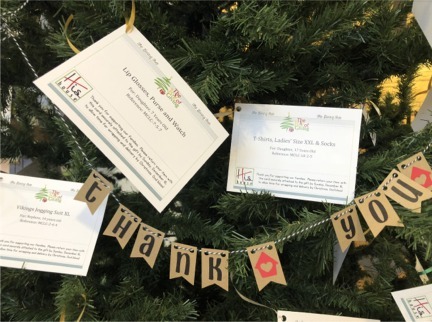 More than half of the families on the Giving Tree were homeless or had recently been homeless. In the mix of all the deliveries we also had a special delivery to a family that had been homeless for 2 years. Right before the holidays they finally got a home. This family was on our Giving Tree so we had several gifts to drop off. But it wasn’t the wrapped gifts that made the 11 year old boy literally jump for joy….it was a mattress we had for him. A used mattress!! This boy was so excited it was wonderful and sad all at the same time. Every year our team at His House is reminded of the meaning of Christmas through the families that we serve. We feel truly blessed to receive such wonderful donations all year long to share with our neighbors in need. Thank you all so much for supporting His House Foundation. Without you, His House would not exist.